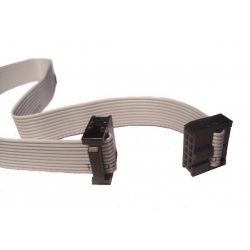 This 12" (30 cm), 10-conductor ribbon cable has a female 2×5 IDC connector on each end that is designed to plug into a 0.100" (2.54 mm) 2×5 shrouded box header. It can also be used with 0.100" male header pins. This cable is well suited to serve as an AVR ISP programming cable, or it can simply serve as a custom cable for your electronics project. If you need a custom length cable, they are extremely easy to make up using..